Sun tan happens when your skin is not protected by clothes or sunscreen and gets too much sun. It could tan or burn. But, the fact is, some people get sunburn while others get a suntan. Why? The human beings have something named melanin in skin. It is something that gives the human skin its color. Those people having dark skin have more melanin in compared with people with light skin. The melanin is made by your body to help protect the deeper layers of your skin from being damaged. When your skin is damaged by sun rays, more melanin will be produced to try to protect your skin more. It causes changes in skin’s color. People with light skin will become more red, burn when going in the sun while those with dark skin will turn darker brown. What Are Possible Harmful Effects Of Sun Tan? There are many ways to follow when it comes to learning how to remove sun tan. 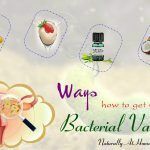 Rather than going for expensive cosmetic products which are jam packed with harmful chemicals as well as bleaching agents, you should consider using some homemade methods prepared from natural ingredients which are easy-to-find and simple-to-use. 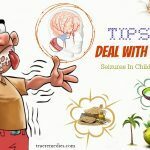 This article from TrueRemedies will show you top effective ways on how to remove sun tan from face, neck, arms and legs. Take a look! Mix a small amount of lemon juice with some sugar and apply over your skin. Sugar is a great cleansing agent that supports lemon juice in removing sun tan. Wait for 15 minutes to let it dry and rinse it off with cold water. Cucumber juice also has natural bleaching agents which can lighten red patches of your skin that are caused by suntan. At the same time, rosewater and cucumber are also cooling agents which can soothe blemished skin. Similar to lemon, when it comes to tips on how to remove sun tan, tomato juice is a great option. It is slightly acidic and has a high level of antioxidants. They might react with skin pigments and lighten sun tanned areas. It is thanks to lycopene available in this fruit. Lycopene is a powerful antioxidant, which could decrease the inflammatory response to UV damage by neutralizing harmful molecules which are produced in the human skin as a consequence. According to a study, people who consumed 5 tablespoons of lycopene-rich tomato paste every day for about 3 months had 25% moiré natural protection against sun tan and sunburn. You can take advantage of tomato for sun tan relief by indulging in fresh tomatoes or adding organic ketchup to your daily meals for a lycopene boost. Actually, eating tomatoes will not make you invincible in the fierce sun but it might be a useful factor to sun protection, aside from sunscreen, clothing or shade. Vitamin E oil is a sold in capsule form, with the capsule helping protect the oil inside. Vitamin E can also help in healing your body from inside out, if ingested, it will reduce skin damage and inflammation. Take 1-2 capsules of vitamin E oil and apply the oil over your skin to increase hydration of your skin and heal the UV damage. Eat vitamin E-rich foods, which are oatmeal, peanut butter, leafy green vegetables, and almonds. Using yogurt is a home remedy for sun tan that does not take from you much time and effort. It is a good answer for people looking for ways on how to remove sun tan. Simply reach into your fridge and take a container of yogurt to start relieving your sun tan. Yogurt has cooling effects and tightening property, so it can reduce redness associated with sun tan. Rinse it off with water and reapply another yogurt layer if your sunburn pain still persists. Do a patch test before applying to your skin. Choose the yogurt which has live cultures. We all known that coconut oil is very good for skin, hair and the overall health. It is very moisturizing, helps prevent wrinkles and fine lines, fight bacteria acne, and of course smell delicious. It is also a good solution for sun tan and sunburn. Studies showed that coconut oil has saturated fats which can be good at retaining moisture of the skin, whilst caprylic, capric, lauric acids have antimicrobial and disinfectant properties that can benefit your skin greatly. Castor oil can repair and rejuvenate the skin from damage caused by overexposure to sun rays. 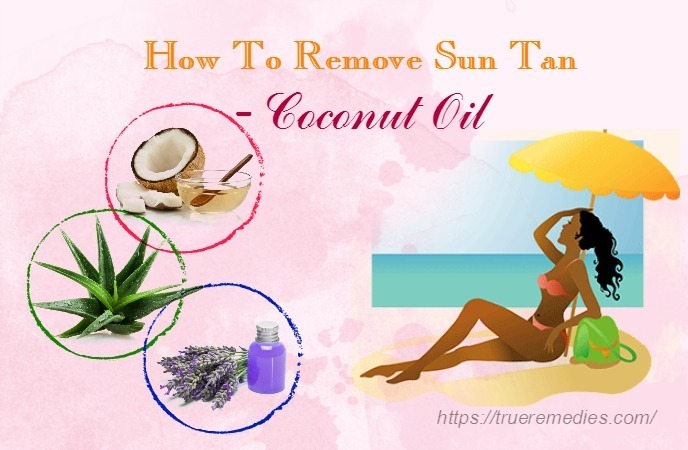 At the meantime, coconut oil, as mentioned earlier in this list of tips on how to remove sun tan, can heal your skin by relieving it from blistering and peeling. Essential oils can nourish the skin while aloe vera soothes your skin. 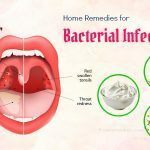 Mix ¼ cup each of castor oil, aloe vera gel, apple cider vinegar with 2 tablespoons of vitamin E oil, ½ cup of pure coconut oil, and 3-10 drops of neem oil, tea tree oil, almond oil and jojoba oil in a bowl. This solution is used as a homemade sunscreen. Aloe vera is the perfect treatment for a bad sun tan. The gel from aloe vera can moisturize your skin and help you avoid the peeling associated with sun damage. Aloe vera has 150 vitamins, minerals, and trace elements, like calcium, zinc, iron, magnesium, copper, zinc, manganese, potassium, amino acids, selenium, and germanium. Aloe vera does not have oil or other elements which clog pores or irritate your skin. It can penetrate deeply into your skin layers and alleviate pain along with swelling associated with sun tan. Thanks to essential nutrients include in cucumber, they help soothe your sun tan. Repeat this routine twice or thrice per day. Using aloe vera can relieve inflammation and also boost tissue regeneration. Starchy potatoes and sweet potatoes could help lessen the harmful effects of sunburn and sun tan. But, the latter seems much better because it has beta carotene and vitamin C.
Potato when peeled and boiled and applied as a dressing could reduce the pain and promote healing process. It is rich in vitamin C which can work as natural bleach. Also, potato can soothe sunburn naturally. Gram flour is another answer for people looking for tips on how to remove sun tan. It is excellent in removing dead skin cells and giving your skin bright and young beauty. You could make a paste of whole green gram or use gram flour in the powder form. You can also use rose water as an alternative for plain water. Mix some lemon juice and yogurt if you like. Cucumber juice has cooling effect which can soothe your skin and eradicate your sun tan. Also, the vitamin C content in cucumbers can naturally moisturize your skin with ease. Using fresh slices of cucumber can also give you similar effects. 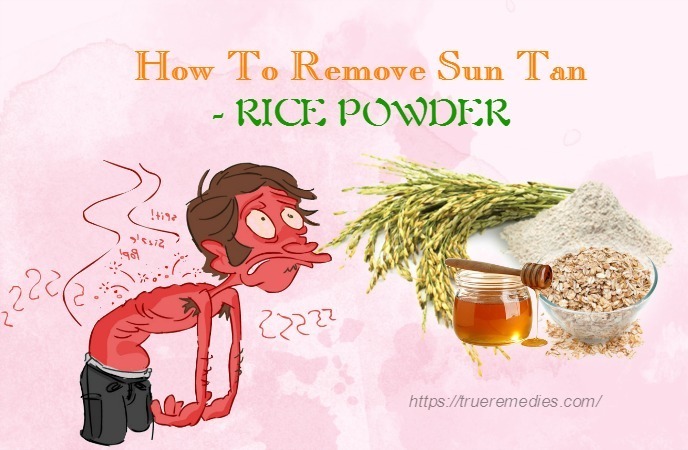 Rice powder has a high level of PABA which can act as a natural sunscreen. Also, the allantoin availability in rice powder can soothe your sun tan and enhance skin regeneration. This mixture will lighten your skin while reducing excess oil, pimples and acne. For larger portions of skin, puree the fruit and apply the mixture over your skin. Or, you can also make apricot or papaya juice by using a juicer and apply to your skin. Kojic acid originates from fungi which can lighten sun tanned skin. Also, it has been used to treat melasma, a temporary skin darkening problem that happens during pregnancy. There are many products containing kojic acid, like soaps, lotions, oils and washes. They have different concentrations of kojic acid, so you should try a few types to find out which are suitable for your specific sun tan. Caution: You need to do a patch test first and follow the instructions of the manufacturer. If after using turmeric, you see a yellow residue on your skin, then use a makeup remover toner or cleanser to remove the color. Mix 2 tablespoons of besan with 1 tablespoon of milk, 1 tablespoon of crushed orange peel and a pinch of turmeric in a bowl and put some cold rose water. Sprinkle some water on the dried areas to moisturize it and use clockwise and anti-clockwise directions of scrubbing to remove the pack. Apply this pack for a couple of days for an effective tan removal. This yellow colored fruit can help you get rid of sun tan thanks to the beneficial enzymes present inside named papain. Papain has potent skin-lightening properties which can reduce the visibility of blemishes, scars and redness caused by sun tan. Papain also purifies and treats irritated skin. A good facial massage using papaya is really great for people who usually spend their time outdoors as it can fight free radicals which age their skin. Other enzymes in papaya are well-known for exfoliation, skin renewal, and restoration. Caution: If you notice any severe reaction to your sun tan with symptoms such as fever, nausea, chills or rashes, then stop using this treatment and consult your doctor instantly. 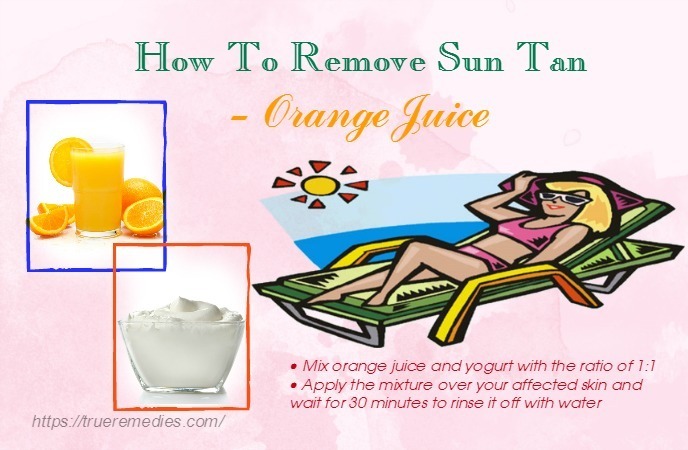 One of amazing sun tan remover is a combination of orange juice and yogurt. This mixture can regenerate new skin cells thanks to the content of vitamin C available in orange. Also, collagen found in orange could slow down the aging process and tighten skin naturally. If you mix red berries and milk cream, you will have a skin lightening solution that improves skin complexion and decrease dark spots, freckles and pigmentation. Meanwhile, milk cream will provide deep nourishment to your skin and moisturize your skin naturally. Because of medicinal properties, sandalwood when applied to sun tanned skin will help remove dead skin cells and reveal new lighter skin cells. 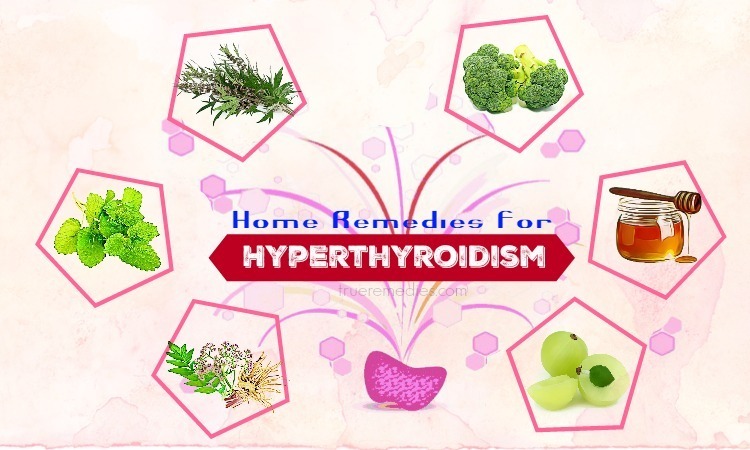 Also, it acts as a soothing balm that can heal blisters and blemishes. This pack can also work as a deep moisturizer. Pineapple has tangy and fresh flavor which is considered as the king of tropical fruits. In pineapple, the enzymes can remove dead cells from burnt and tanned areas. Also, the high content of vitamin C and antioxidants in pineapples can neutralize damaging effects of free radicals along with oxidative stress, slow down signs of aging such as freckles, wrinkles, fine lines and pigmentation. Fuller’s Earther is known as Multani Mitti, which has cooling effect that can soothe and cool the skin burns and alleviate skin irritation, acne, rashes, and blemishes. To reduce sun tanned skin, you should mix fuller’s earth with aloe vera gel. 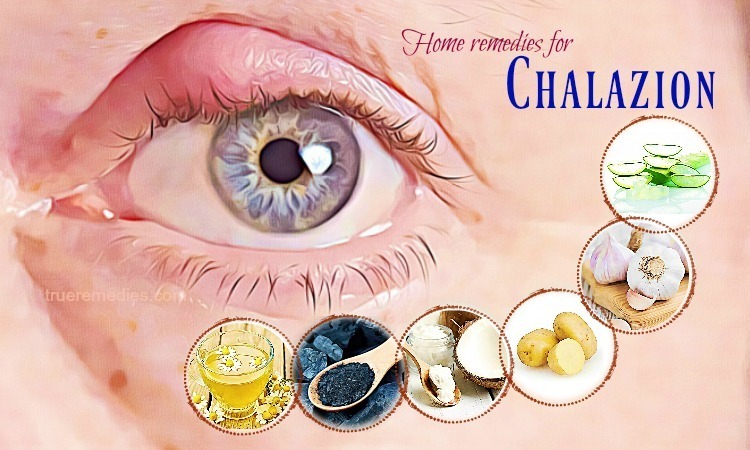 This mixture will not only brighten your skin but also act as a natural cleanser. Cornmeal is another answer for your question on how to remove sun tan. 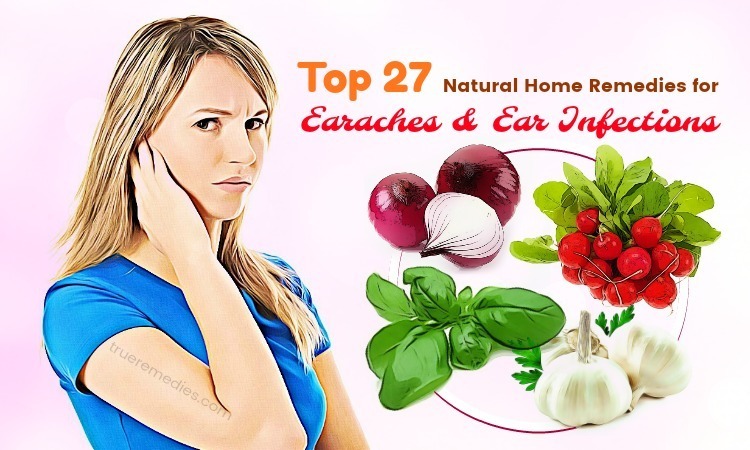 It helps remove dead skin cells and blackheads, rather similar to oats. The minute granules of cornmeal can polish your skin gently. Especially, cornmeal is very effective in removing excess oil as well as sebum from your skin without drying out it. How to remove sun tan with easy-to-find ingredient? 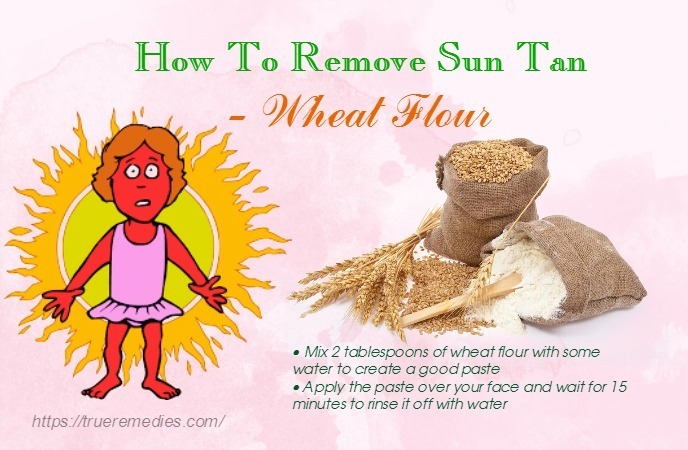 Applying wheat flour on tanned skin can lighten your skin, eliminate dark spots and even skin tone. As a result, you will get brighter and softer skin in no time. 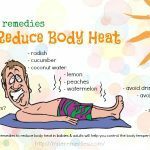 Bitter gourd is a great solution for your stubborn sun tan thanks to its anti-oxidants. It can be easily found in your weekday menu, so making it part of your beauty routine is an excellent step to remove your sun tan. Not only are almonds a crunchy delight to include in morning smoothies, but they are also really great for your skin. Due to the high content of vitamin E, almonds benefit skin effectively. Almonds are also a bleaching agent that helps you remove your sun tan fast. 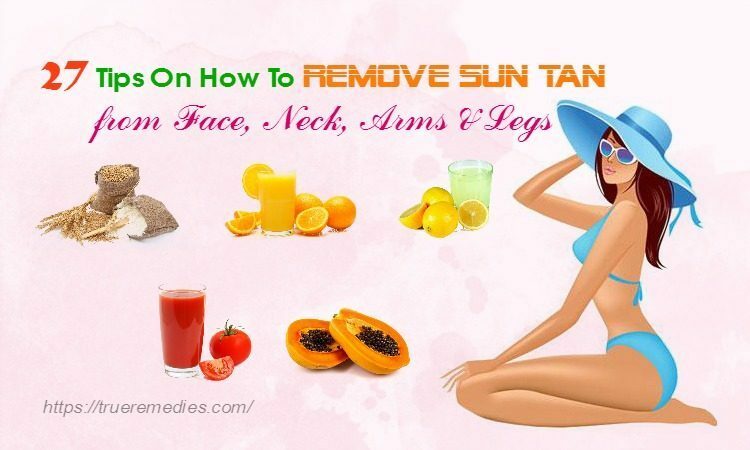 Here, you have discovered 27 effective tips on how to remove sun tan on face, neck, arms, and legs. These tips are just for your reference. 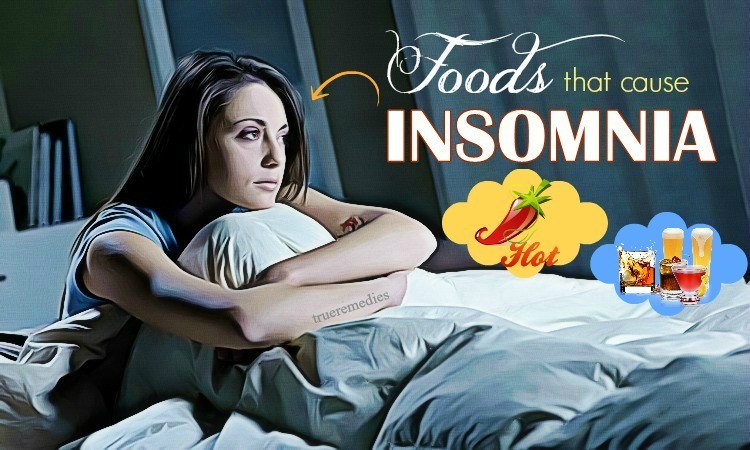 Try some of them and see how they work for you. But if after trying, your problem does not get better, consult your doctor for professional treatment. 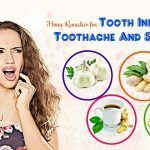 If you have any comment about this post of Top 27 Tips on How to Remove Sun Tan on Face, Neck, Arms and Legs. For further knowledge about “how to do something” topics, feel free to refer our page How To page here.